Broccoli is in the cabbage (cruciferous) family and related to brussel sprouts and cauliflower. It was developed from wild cabbage during Roman times. It has a large flowering head that is eaten as a vegetable. The word broccoli is Italian meaning cabbage sprout. It was first introduced to the United States by Southern Italian immigrants. It was not widely accepted as a vegetable until the 1920s. Broccolini is similar to broccoli but has smaller florets and longer, thin stalks. It is a hybrid of broccoli and was developed by a seed company in Japan in 1993. They both have the same nutritional value. Broccoli is classified as a super, all-star food with many health benefits. Broccoli contains a sulforaphane, a sulfur-containing compound present in cruciferous vegetables. Researchers are studying the anti-cancer properties of sulforaphane and have come to interesting conclusions, although more research is needed. One cup of broccoli offers as much vitamin C as an orange, and is a good source of beta-carotene. It contains vitamins B1, B2, B3, B6, iron, magnesium, potassium and zinc. It is a good source of fiber and is low in calories. Broccoli can be eaten raw, steamed, roasted, and stir-fried. To roast broccoli: Slice broccoli into bite size pieces. Toss in in bowl with 2 Tbsp olive oil, salt and pepper to taste. 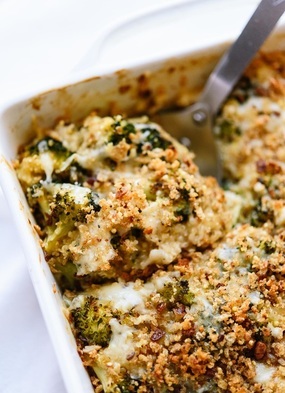 Arrange in single layer on baking sheet with parchment paper and bake for about 20 minutes until broccoli is tender. Take out and cool. To cook quinoa: Bring vegetable broth or water to boil in medium sized pot. Add quinoa, reduce heat to low and simmer 17-20 minutes, or until liquid is absorbed. To make breadcrumbs: Tear bread into bite size pieces and toss them into a food processor or blender. Process until bread is in small crumbs. In a small pan, over medium heat, melt the butter, and garlic, cook until fragrant and stir in bread crumbs until browned and crisp. Put quinoa in a mixing bowl and add salt, pepper, red pepper, 2 cups grated cheddar cheese, and milk. Then toss in the broccoli. In fry pan heat olive oil and add onion, celery, smoked paprika, salt and pepper. Cook until onion is soft. In a large kettle put 3 cups of vegetable broth, 2 cups water and broccoli. Cook for 5 minutes, then add the onion mixture and cook for 20-25 minutes. In a medium pot add the cauliflower florets with water and cook until the cauliflower is fork tender, Drain all of the water when finished. 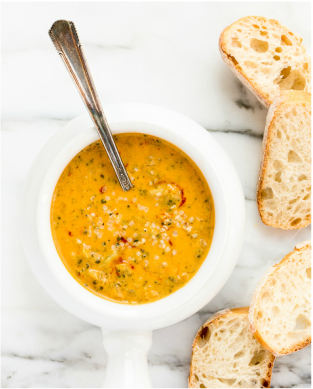 In a high speed blender add the 1 cup vegetable broth, cooked cauliflower, Hemp Hearts, roasted red peppers, nutritional yeast, cornstarch, apple cider vinegar and 1 tsp salt. Blend on high for 2 minutes until smooth and creamy. When the broccoli is cooked well, add the cauliflower sauce into the pot and stir. Cook for a few minutes, stir until it is thickened. Remove from heat and add lemon juice and soy sauce. Taste and season with more pepper, salt or smoked paprika to taste. 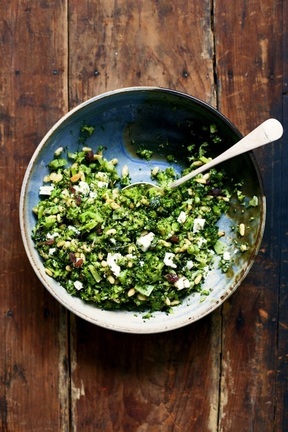 For the salad, on a large rimmed baking sheet, toss broccoli, pine nuts, oil, oregano, salt and pepper. 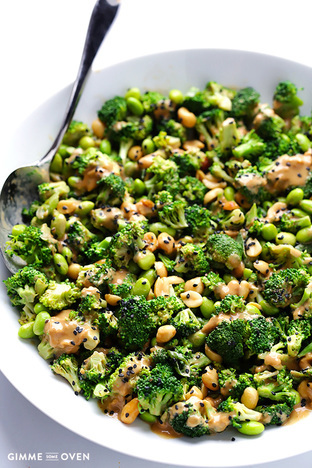 Spread into an even layer and roast for 15 minutes, until broccoli and pine nuts are beginning to brown. Add to a large bowl and cool for 10 minutes. Add feta and raisins. For the dressing, in a small bowl, combine vinegar, olive oil, garlic and nutmeg. Add to broccoli mixture and toss to combine. Serve immediately or cover and chill for up to 2 days. To make the Broccoli Salad: Heat a large pot of water until it is boiling. Add in the broccoli florets and boil for 30 seconds. Use a strainer to transfer them into a bowl of ice water, which will immediately halt the cooking process. Drain. Then add the remaining ingredients and toss until combined. Serve immediately, garnished with sesame seeds if desired. 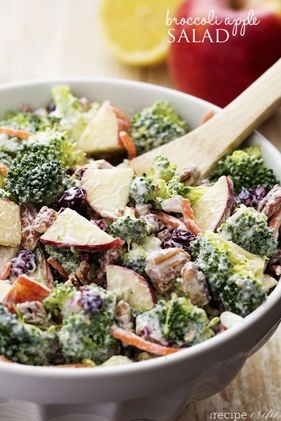 In a large bowl combine broccoli, carrots, red onion, apples, pecans and dried cranberries. To make the dressing: Whisk together vegenaise, greek yogurt, lemon juice, sugar, salt and pepper.